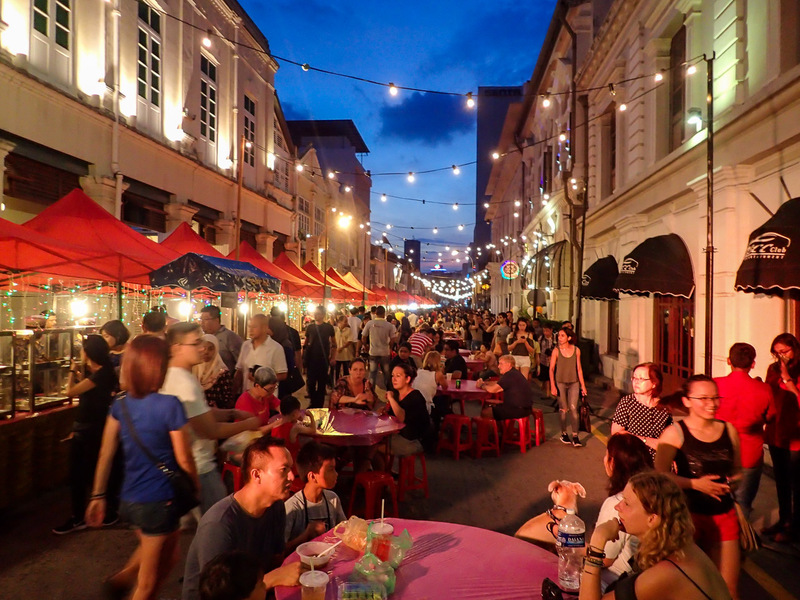 Penang is the food capital of South East Asia and is paradise for any foodie due to its diverse array of cuisines and flavours. You will find Chinese, Indian, Malaysian, Western and everything in between, all serving up unique twists on the classics, as well as more innovative fusion dishes. 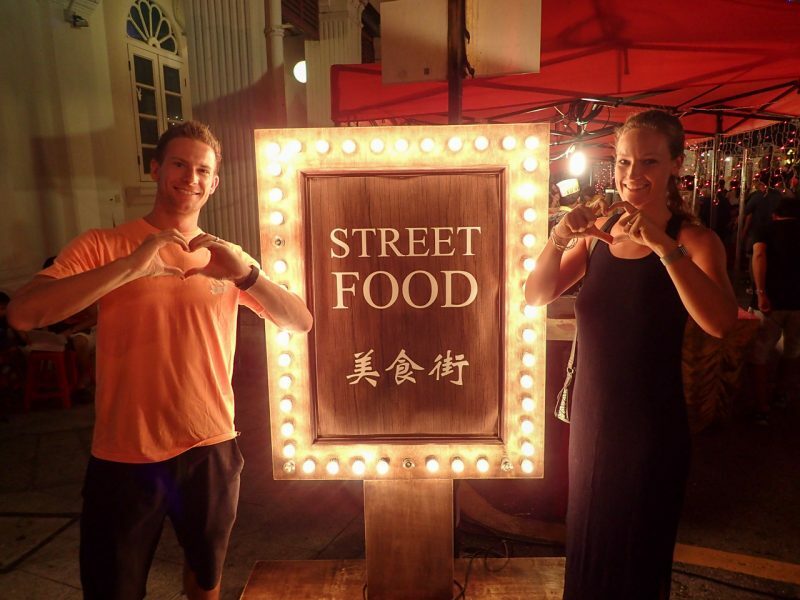 To find the best of these Malaysian street foods we consulted many online travel & food blogs on what is the “best street food in Penang / George Town” and the “top cheap eats in Penang“, compiled them together in a big list and set off a mission to try them all over 4 days. 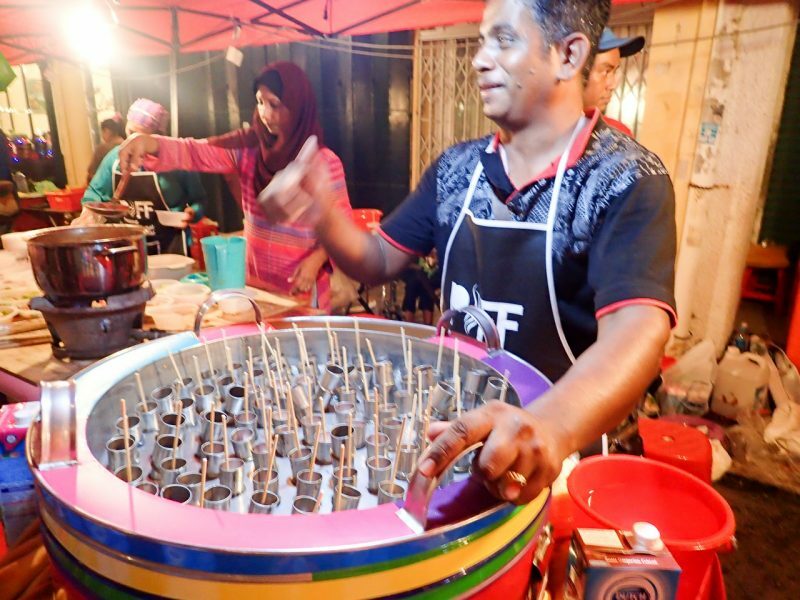 This may seem a little ambitious but we got lucky and happened to be in Penang during the Penang International Food Festival which allowed us to try multiple things in a short amount of time. Don’t fret about finding “The Best” as the food is good everywhere. Everyone has different tastes, plus it may even be a different cook on the day you visit. 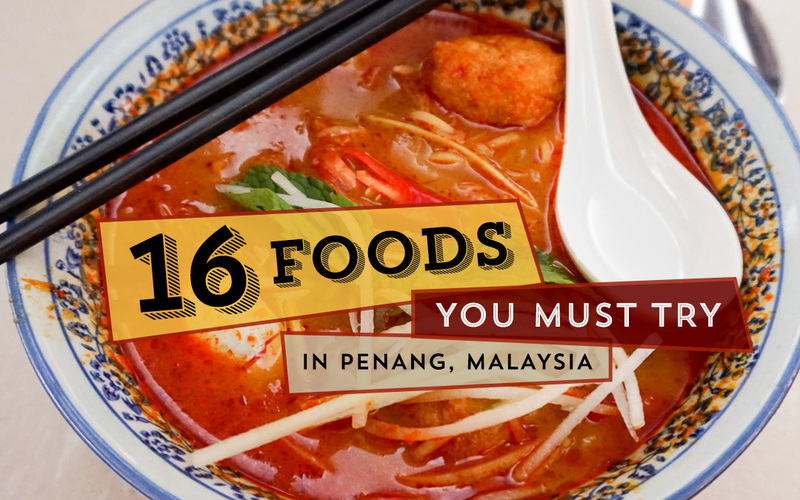 Just go out and explore, and make your own “best food in Penang” compilation. This compilation is in the main area that most tourists frequent, but greater Penang is quite large so don’t be afraid to venture out. 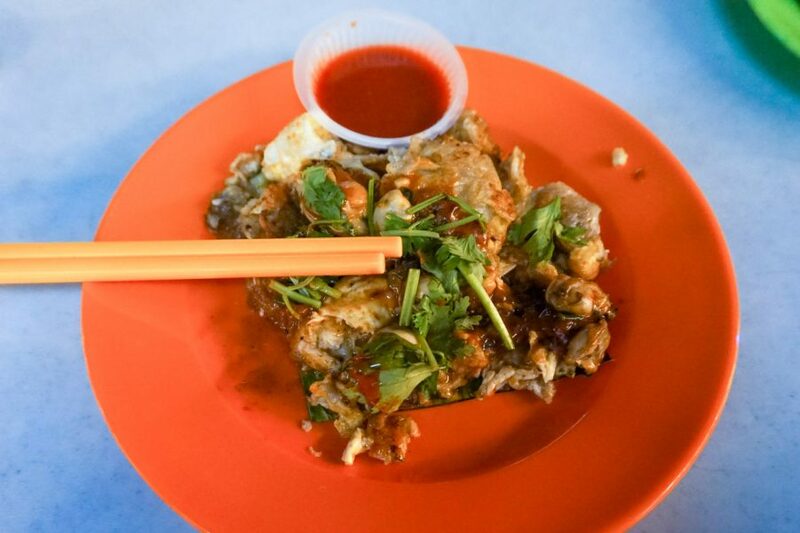 Eat like a local with our free self guided walking map of Penang’s best restaurants & street stalls. Click on each pin & look at the description to see what to get at each place. 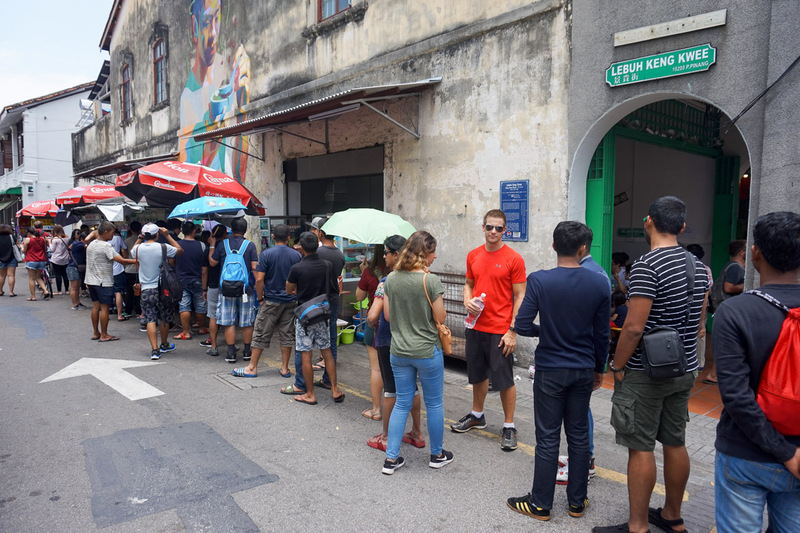 Lines are notorious in Penang so if there is one, it means the food is worth it, so be patient and chat with the locals. Breakfast and dinner are the busiest times to eat. Often restaurants will close by 2:30/3pm and re-open for dinner. The more popular restaurants can easily sell out of their dishes by lunch so get there early. 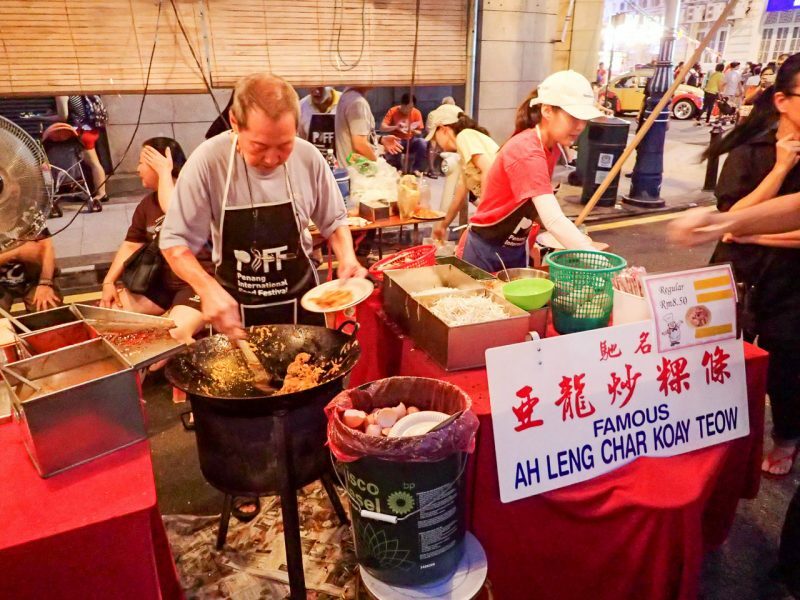 Food critics name Penang as the best street food in Asia. 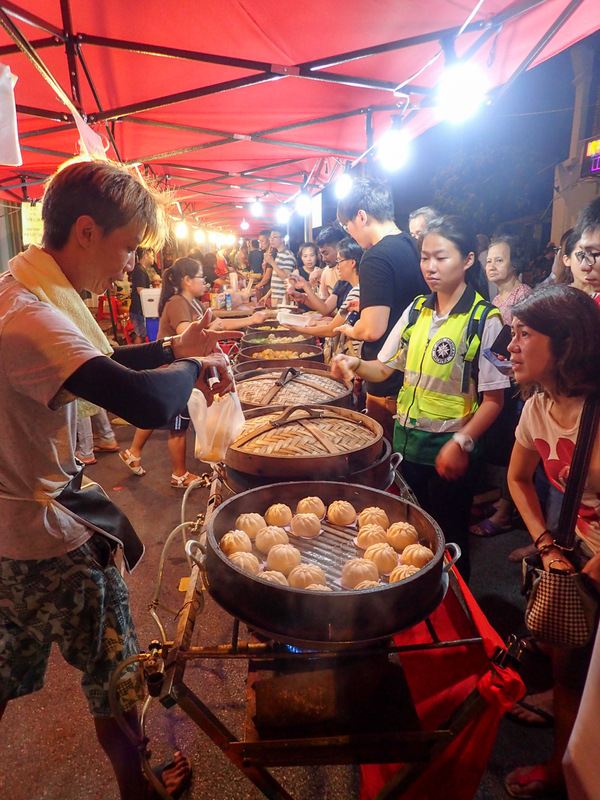 Street food dishes range from 4 MYR to 13 MYR ($1-$3 USD). 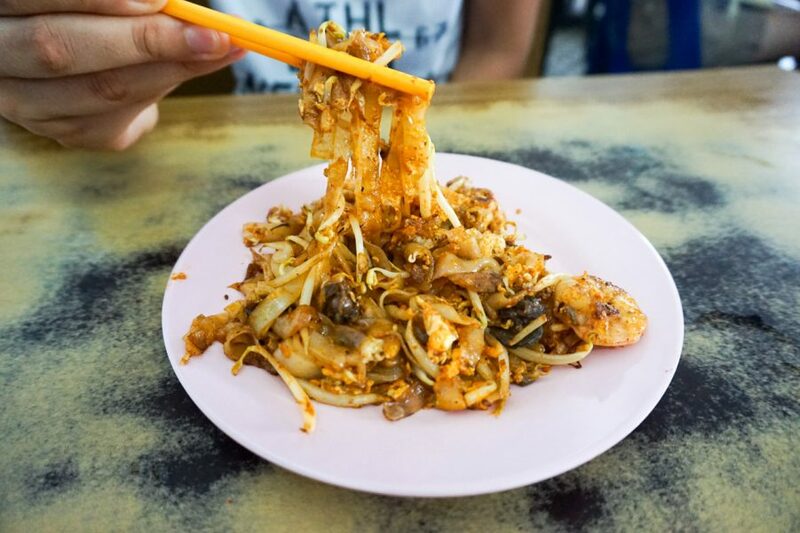 Char Koay Teow is one of the most iconic street food dishes in Penang and you will find it everywhere you go. 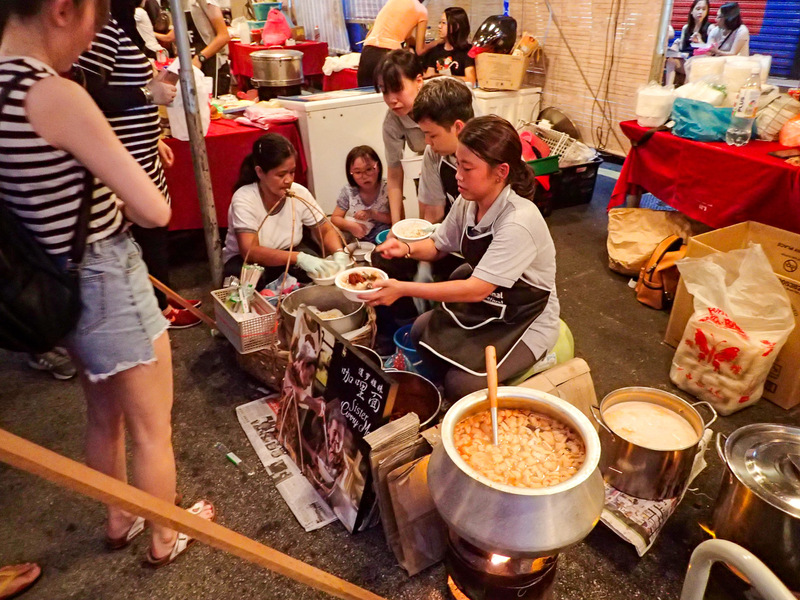 The name means “stir-fried rice cake strips” and is quite similar to ‘Char Koay Kak’ (our number 10), however, they are rice noodles rather than cubes. This marvellous noodle concoction is made by frying the noodles in pork fat with a light and dark soy sauce, prawns, briny cockles, chewy Chinese sausage, crispy sprouts, fluffy egg (chicken or duck) and a hint of chilli, often served on a banana leaf. Some places include ‘pig blood cockles’ so if you prefer it without that, just ask. We tried it at Tiger Char Koay Teow @ Kafe Ping Hooi with the cockles (though we ended up taking these out) and duck egg which created a thicker, creamier taste. The overall taste of this reminded us of Pad Thai but it was much richer & deeper with flavour bursts from the fresh prawns and chilli. 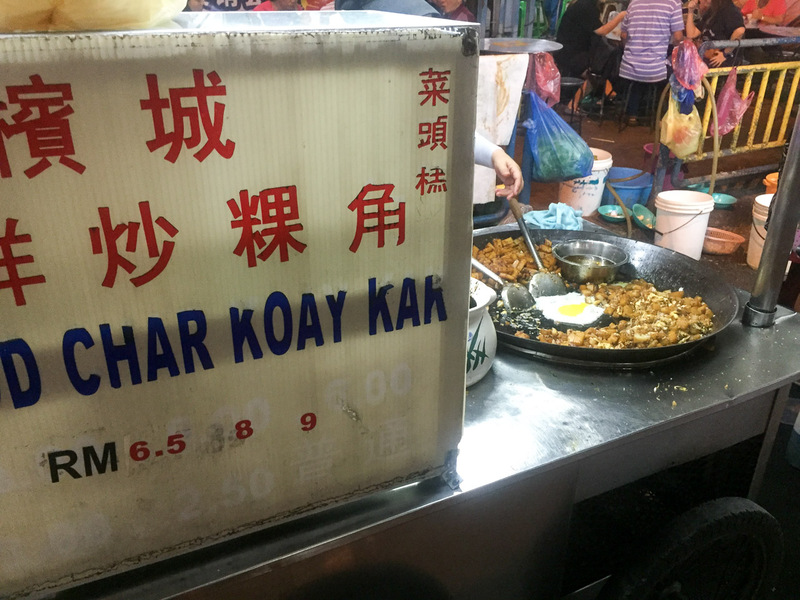 The oyster omelette, also known as “Oh Chien” is a culinary delight amongst the list of street foods in Penang and surprisingly Jacob enjoyed this A LOT. Although he enjoys salty raw oysters, this dish is vastly different and a totally different experience. The oysters are fried in an egg & rice flour batter (to make it crispy), with chives and then accompanied with a spicy chilli or garlic sauce. The metallic taste is non-existent so you end up with a fluffy omelette with little bursts of flavour. Really tasty! 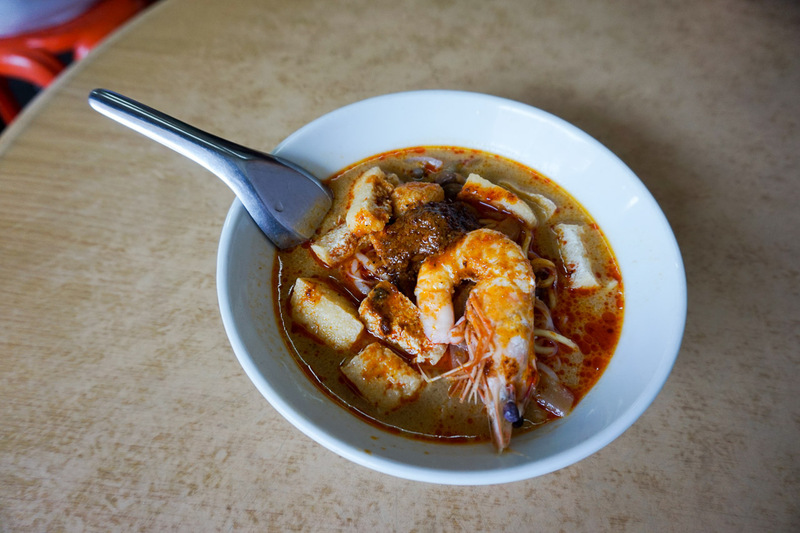 Curry Me was one of our favourite dishes in Penang, similar to a traditional coconut laksa found in other parts of Asia. 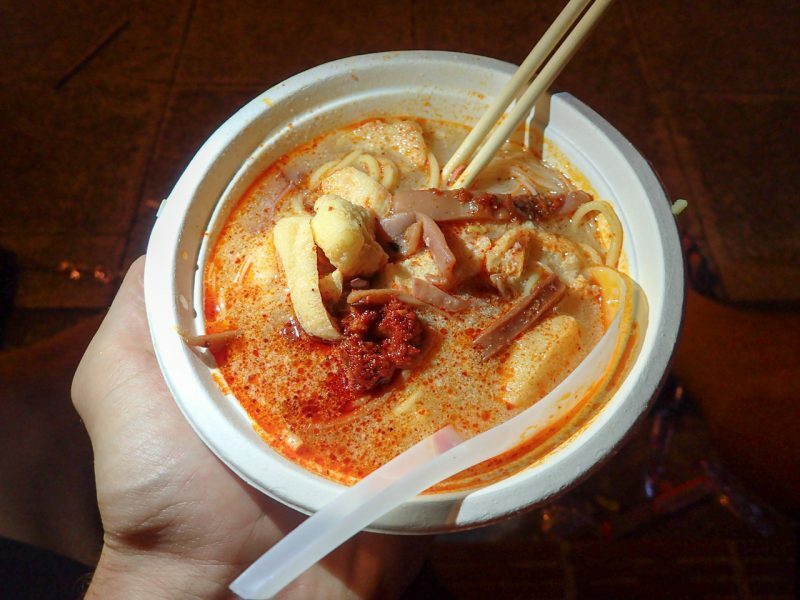 The Curry Mee dish is a soup formed with a combination of curry and coconut milk, typically involving yellow noodles and rice vermicelli, fried bean curd, cockles, prawns, cuttlefish, cubes of pig’s blood and bean sprouts. We weren’t too keen on the pig’s blood but without it, it was still delish! 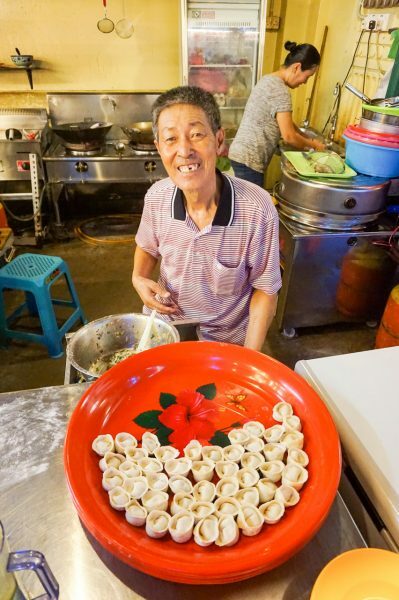 These 2 sisters have been selling tasty bowls of Curry Mee for over 70 years! Now that says something! Dedication. With the Chinese having such influence in Malaysia there is no surprise that Crispy Duck is on the menu everywhere. And it’s a serving of delicious. 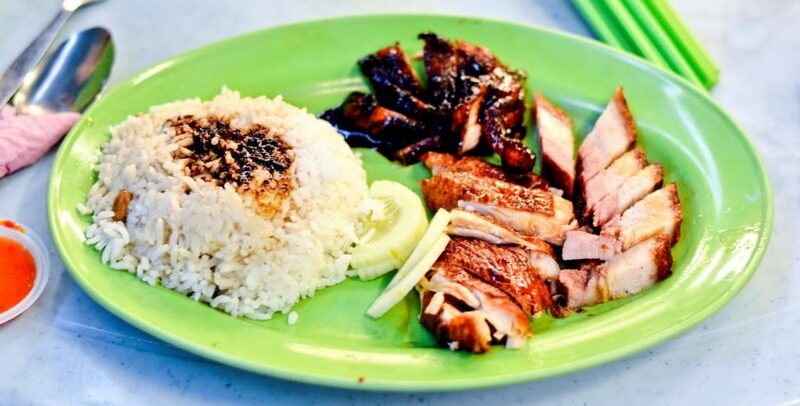 The duck is basted in a sweet and spicy sauce and often served alongside boiled rice and chives. Look out for places that hang multiple ducks in the window with a line, a sure sign that the restaurant is popular and turnover is high. 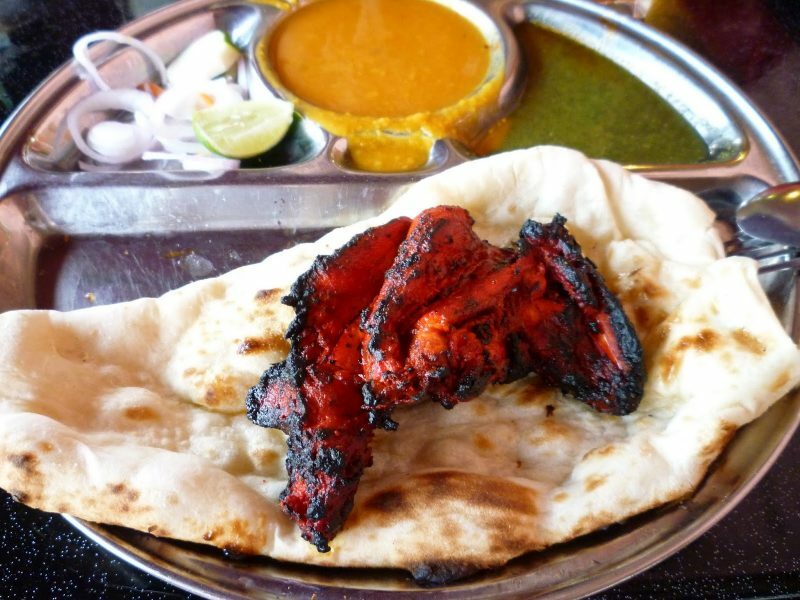 If you’re coming to George Town, you must visit the famous restaurant “Kapitan” located in little India. They served the BEST tandoori we’ve ever had (even after 3 weeks in India), and all for just $2.50 USD. Their menu is quite extensive with curries, grills, and shakes, but they are notoriously famous for their clay pot biryanis and tandoori chicken naan sets. 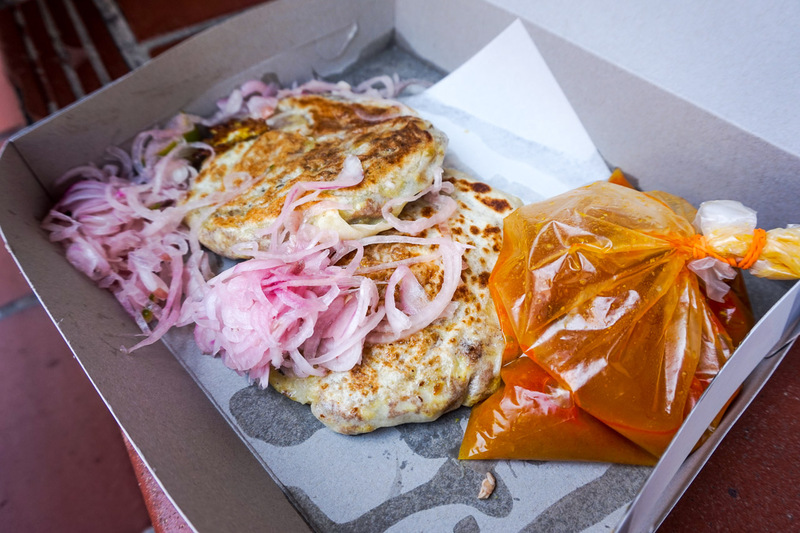 Murtabak is a pan-fried folded flatbread that can be plain or stuffed with chicken, mutton or egg and then served with a side of lentil curry and pickled onions. We had these at the Penang International Food Festival and they cost a mere 50c each! Sloppy, gooey and delicious. 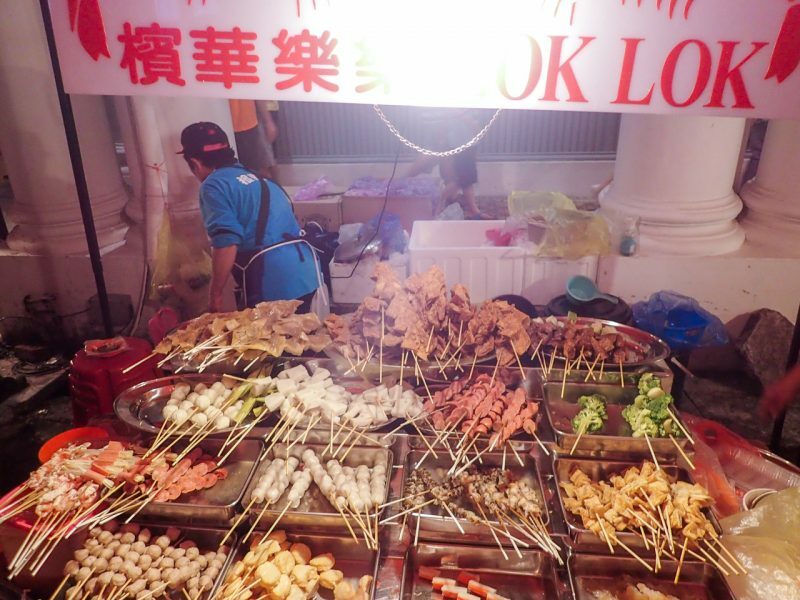 Lok Lok is a communal form of eating in Penang where a variety of different ingredients are placed on skewers such as oysters, vegetables, shrimp, crab sticks, fish/meatballs, mushrooms and even pig ears. Once you choose what you want, there is a communal pot of boiling water to cook your food in. Locals will recommend what sauce to choose based on the stick you have. All of the skewers have different colours which will indicate a different price. Once you’ve finished your meal, count the sticks you have left on your plate and the vendor will total your bill. Try it at: Any night time hawker centre. You can’t really go wrong. 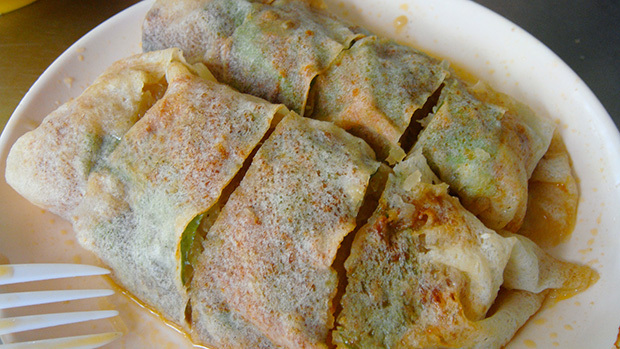 Popiah is a Chinese spring roll that is served fresh, not deep-fried. The outside has the same consistency of a very thin crepe and the inside is full of saucy ingredients such as soybean curd, grated turnips, french beans, fried tofu, chopped peanuts, shredded egg, Chinese lettuce and occasionally, crab meat. This sweet and soft creation is then dipped in a variety of sweet chilli sauces to finish it off. 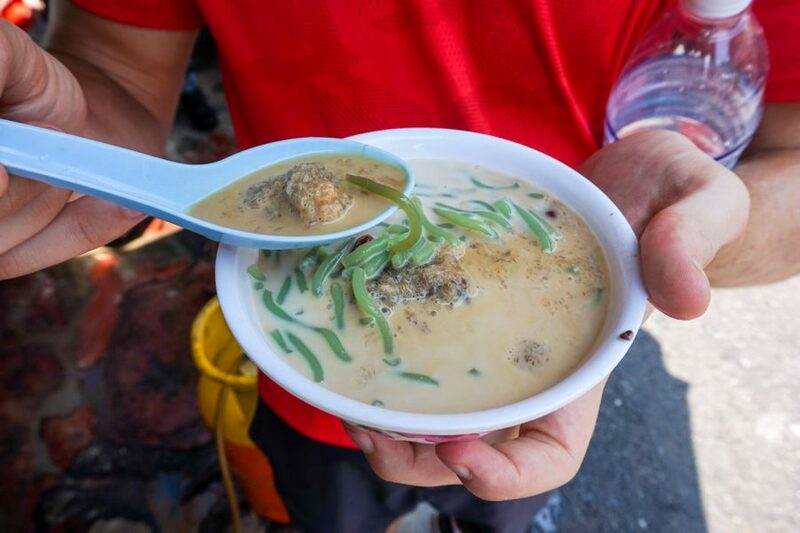 Asam Laksa is Penang’s most famous dish and is rated #7/100 in the world’s top food, although we wouldn’t agree. Asam Laksa is a rich fish-based noodle soup with thick rice noodles, a tart herbal broth, chilli paste, lemongrass, shrimp paste & mackerel. The base is tamarind so it is a lot sourer than the coconut curries and boasts an incredibly fishy, tangy taste. Char Koay Kak literally means ‘fried squares of rice cake’ and these rice cakes are pan-fried in soy sauce with thick flat noodles, chilli and served with bean sprouts and spices. The cubes range in texture and can be soft and spongy or firm and chewy. Recipes differ between vendors but the base ingredients will always stay the same. It’s a popular breakfast food usually served in smaller portions than other dishes. The term “Rojak” simply means a mixture. 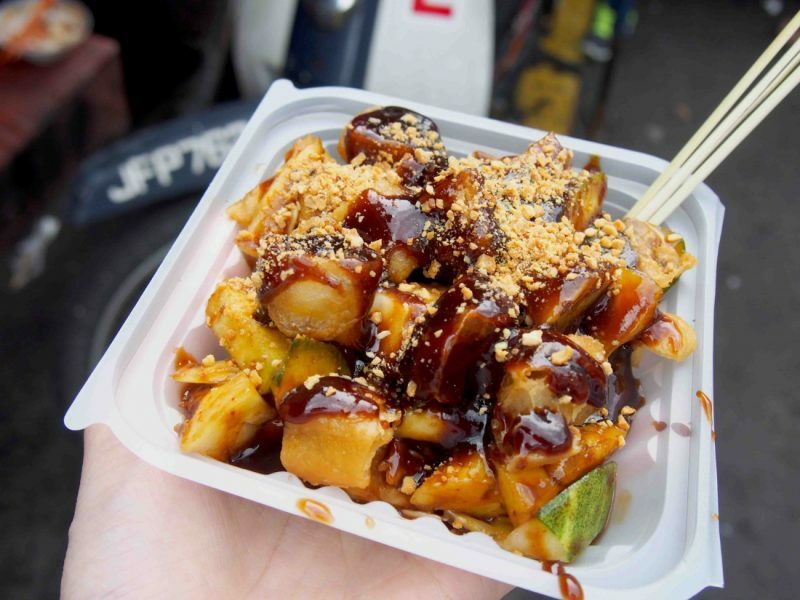 A Penang Rojak is a traditional Asian fruit and vegetable dish commonly found in Malaysia consisting of bean curds, fritters, bean sprouts, cuttlefish and an assortment of fruits and covered in a thick syrupy peanut or shrimp based sauce. It was terribly sweet and we can’t say we loved the combination of flavours. Try it at: We had this at the Penang Street Food Festival so have no recommendation. 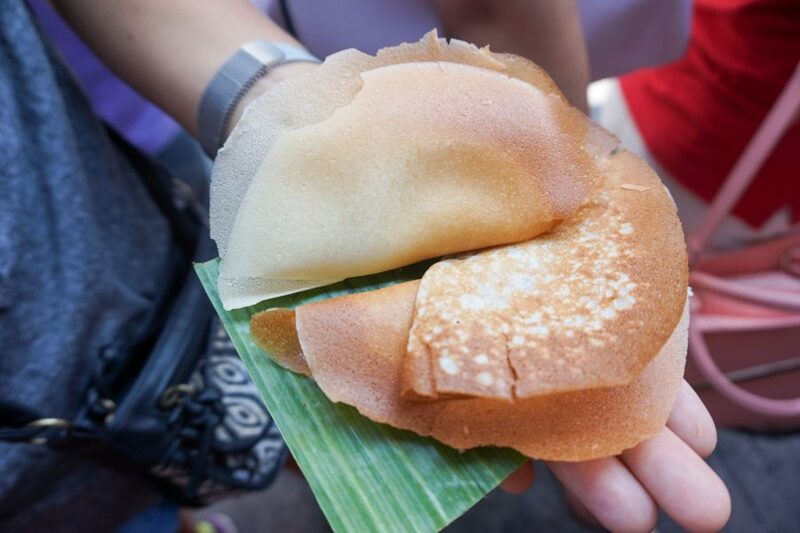 A common snack or dessert, that resembles a crepe and similar to the ‘hoppers’ in Sri Lanka. Apom Manis are made with sugar, egg, coconut milk and flour. The mixed flour batter is poured into a small clay pot or a mini bowl-shaped wok to form a thin crispy pancake with a puffy centre. They are light and fluffy and great for an after dinner dessert! Apart from the basic apom, you can add many additions such as egg, bananas, coconut or sugar to the centre, but we preferred them plain. 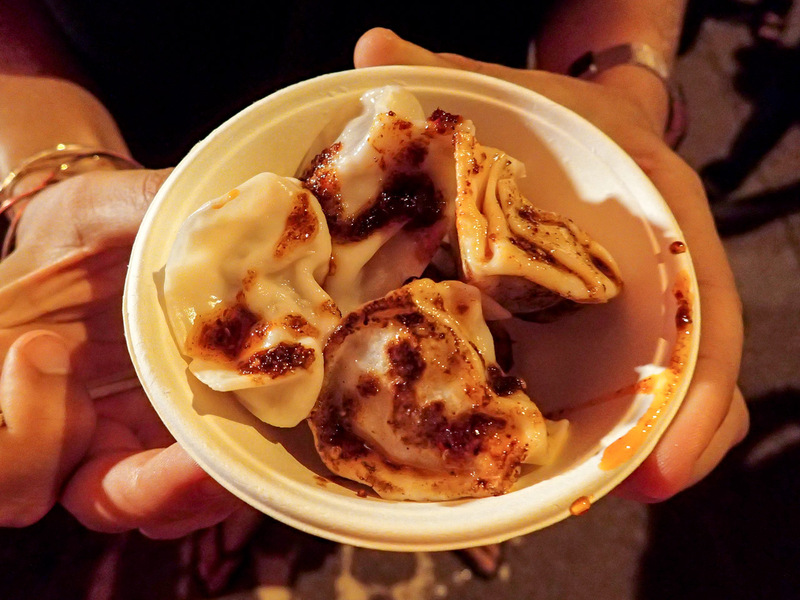 Try it at: We had these at the Penang Street Food Festival so have no recommendation. Such an interesting concoction! 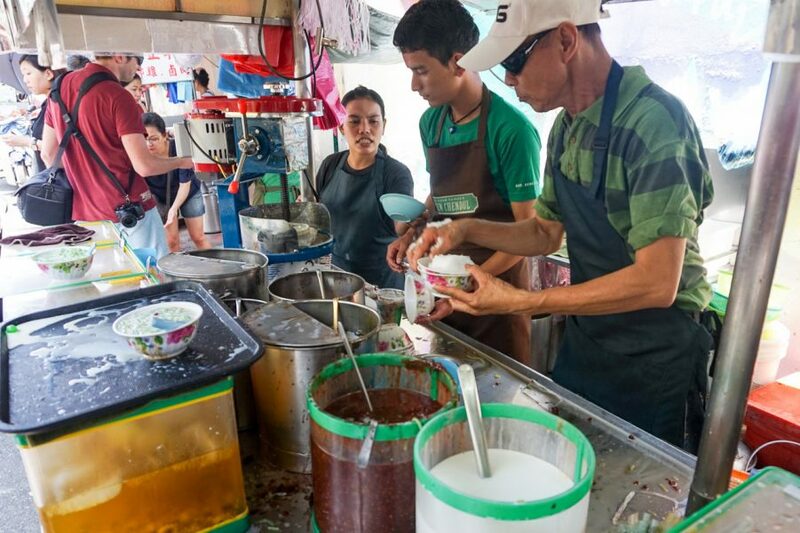 A bowl of shaved ice filled with chewy green rice flour jelly (cendol), red kidney beans, fresh light coconut milk (or condensed milk) and then sweetened with a splash of gula Melaka (brown sugar) syrup. 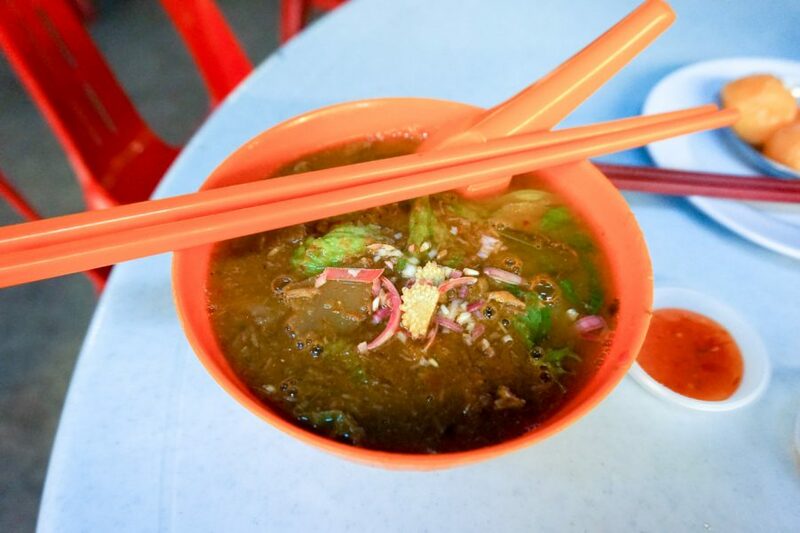 The best place to try this is the famous “Teo Chew Cendol” who have long lines daily. These guys know what they’re doing, and you’ll see the speed of service as coconut milk and ice splashes the sidewalk. The line goes quickly, so put your patience pants on. Ais Kachang literally means “Ice Bean”. 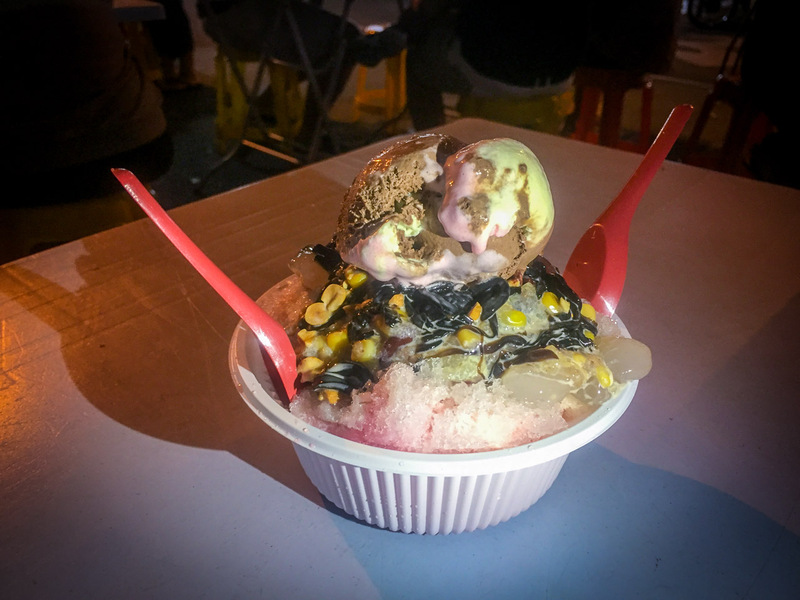 This dessert was originally made with just shaved ice and red kidney beans, however, the number of ingredients added has grown. 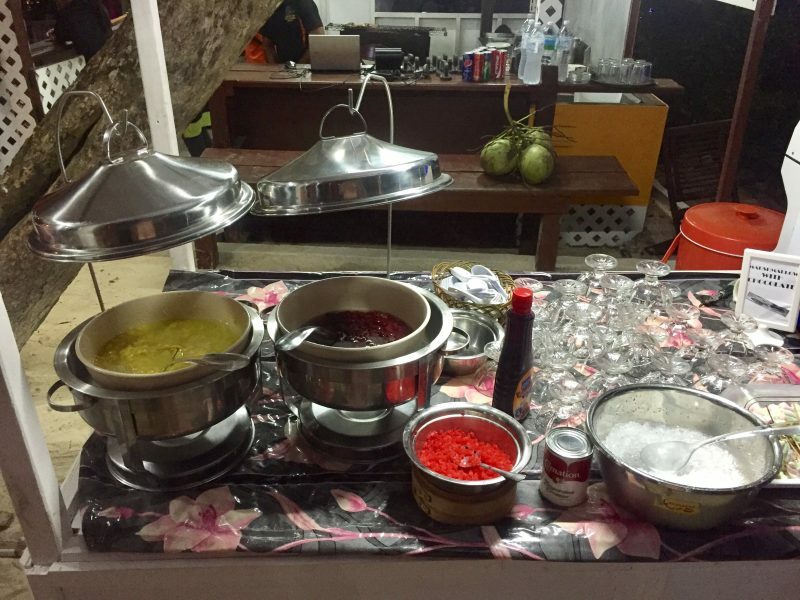 Nowadays you’ll find this dessert with bright colour toppings, different fruits, sweet corn, jelly, attap chee (sweet, translucent, gelatinous balls) and drizzled with condensed milk or coconut milk or ice-cream. So bizarre! 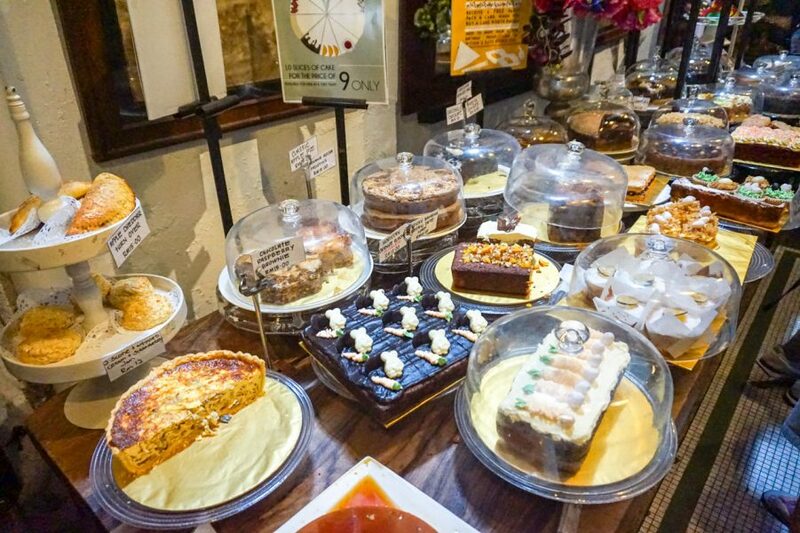 It sounds strange to come to Penang and eat cakes but China House could put any bakery to the test. They have over 50 cakes on display during the day from cheesecakes to brownies and everything in between. The slices/portions are massive and range from 14 MYR – 20 MYR ($3 – $5 USD). Ice cream is everywhere throughout George Town. Every corner store, every restaurant and everyone was always eating ice cream. This was pure heaven and we enjoyed coconut ice cream multiple times a day. When it’s only $1 a cup how can you not? 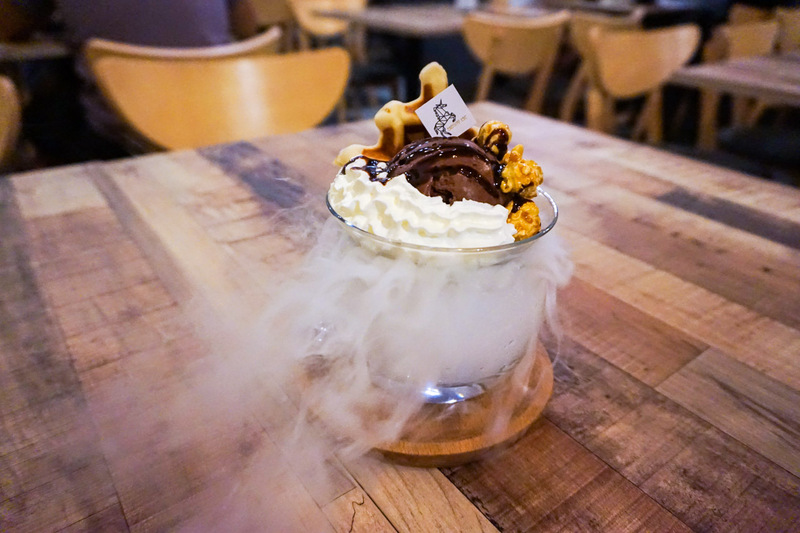 For a slight twist on ice cream, head to Ice Estate (formally Merry Me). 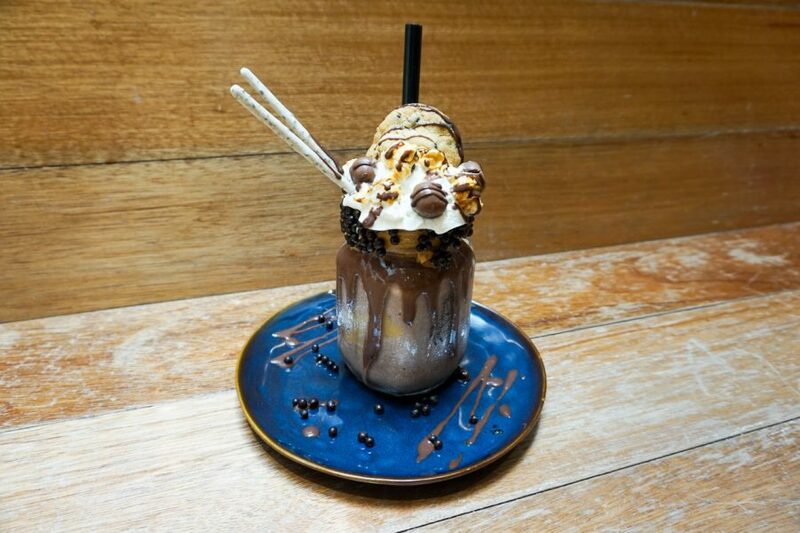 Ice cream shakes with delicious toppings, waffles with ice-cream, ice-cream toast, (yes toast!) and ice cream served on top of dry ice. The presentation was 10/10 and the novelty, oh so fun. 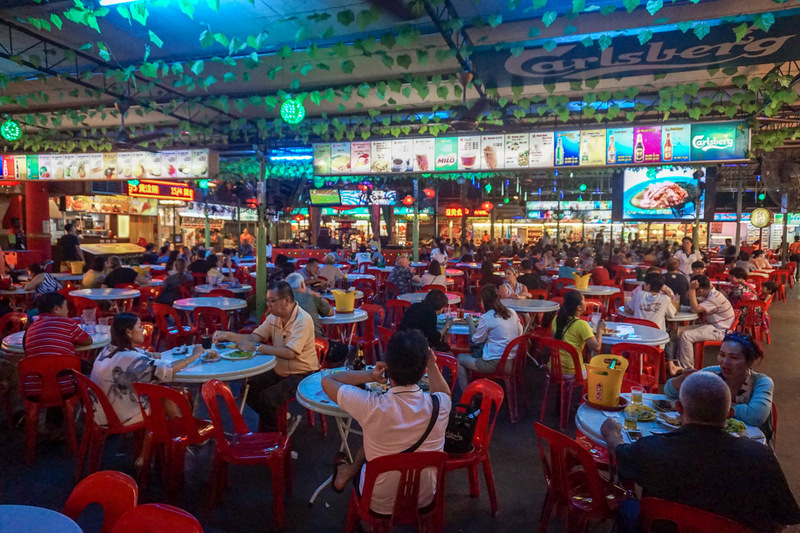 Hawker Centres are open-air food courts serving inexpensive food, with different vendors selling their own unique dishes. Orders work on a pay-as-you-go basis and are brought to your table of choice. It’s quick, cheap, tasty and fun! We often had 4 or 5 dishes on our table for under $10 USD. 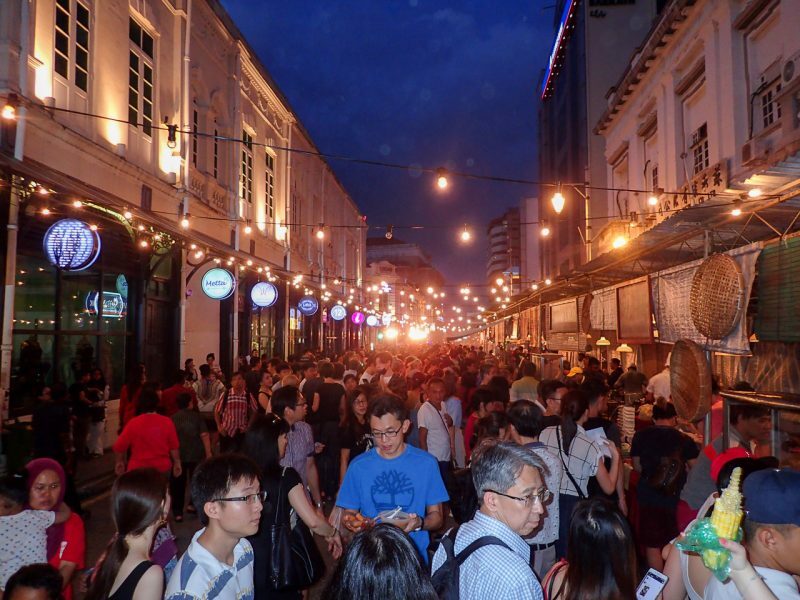 New Lane (George Town) – Busy, locals not as large as the other two. 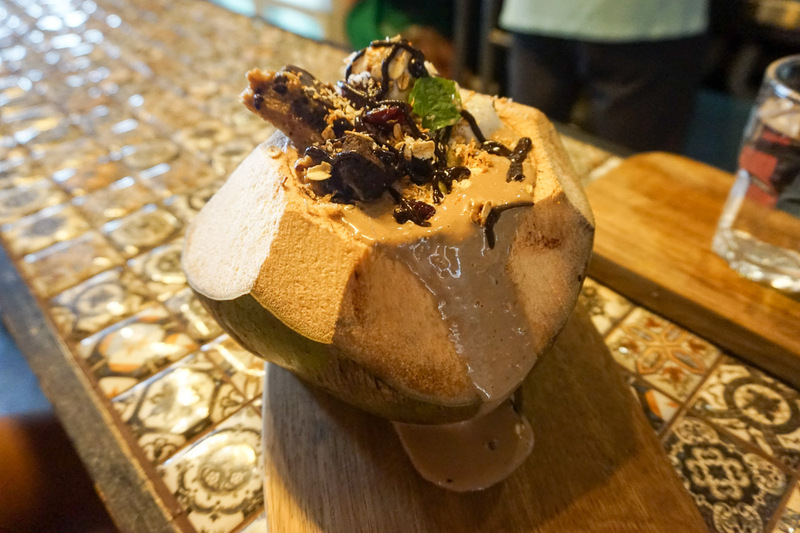 Red Garden Food Paradise (George Town) – Our favourite of them all. Clean, a lot of options, live music and covered tables and chairs. Gurney Drive (Gurney) – One of the more touristic of the Hawker Centres. A lot of variety and just 20 minutes by taxi from George Town. As we pulled up in George Town late on a Friday evening, we couldn’t help but notice all the stalls, lights and stages being set up. 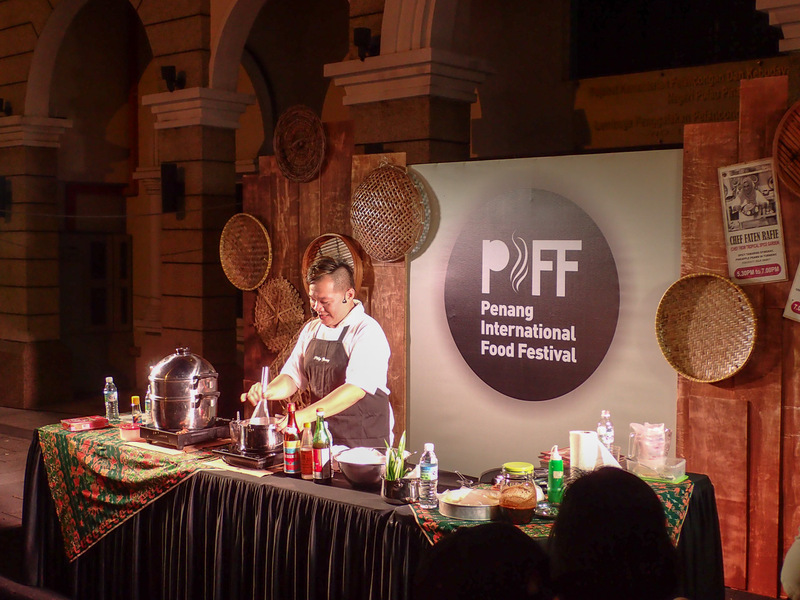 We asked one of the locals what was going on and he just pointed to the big sign “Penang International Food Festival“. Yes! What great timing to arrive in a city known for its food, total fluke! The gastronomic event is spread over 16 days in April, consisting of three major events as well as 20 smaller events like cooking workshops, pop-up markets, food tours and talks by the experts. We couldn’t contain our excitement. The first day of the festival was on the main street in George Town and there were 100’s of food stalls, games, live music and fireworks. 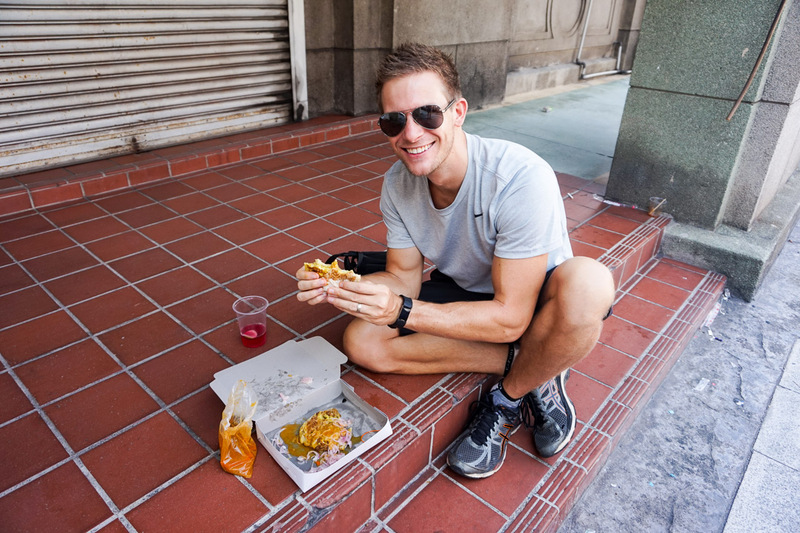 We ate for hours as we sampled our way through the markets. 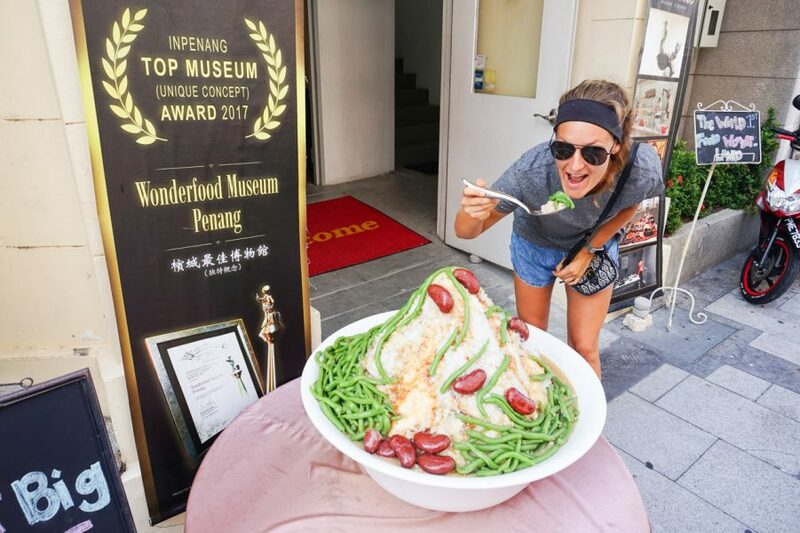 The food in Penang was nothing short of plentiful and it would be impossible to go hungry in the historic city of George Town… come hungry, leave happy! 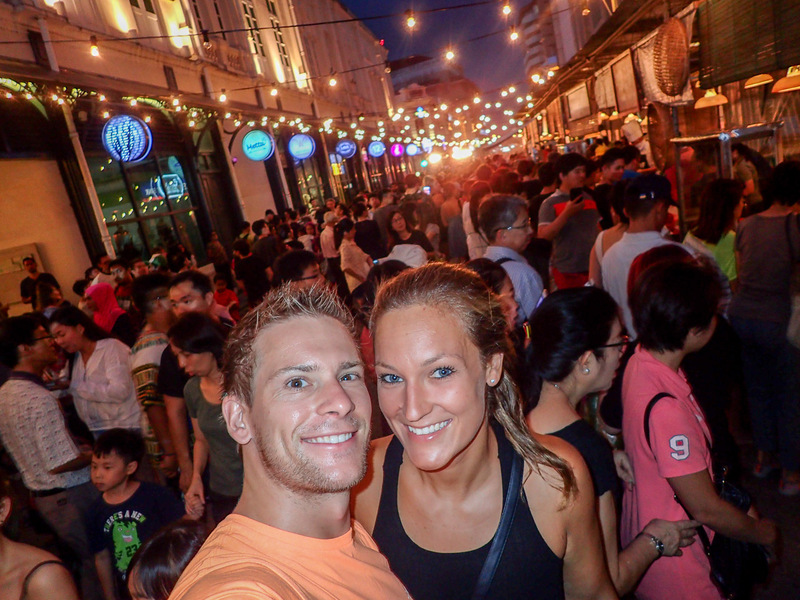 Don’t wait any longer to book your next trip to George Town, Penang! There’s plenty to see and do aside from eating as well! See our 7 Top Things to See and Do in Penang. Don’t forget to come hungry ;).